This is lesson 3 of 42. This series is currently in-progress and will have new lessons each week, visit Bethany’s author page to see the latest available. Start the lesson off by reviewing the previous lessons- “God is Almighty” and God is the Alpha and Omega”. Have one of the kids in the group remind you of the definitions and the motions. You may also want to review where in the Bible we see these attributes of God. Explain that you will read a verse and that they should do a motion to indicate which truth about God the verse is talking about. If the verse tells us that God is ALMIGHTY make strong arms. If the verse tells us that God is the ALPHA & OMEGA point forward with one hand and backward with the other hand. If you think the verse is about today’s new truth (God is AWESOME) then do your best shocked or amazed face. Get the discussion started by setting the stage for the story. Remind the kids that the book of Exodus starts with God’s chosen people enslaved in Egypt. Remind them that God had promised Abraham years before that He would give Abraham’s family the promised land. BUT one of Abraham’s great-grandsons – Joseph- had been sold into slavery in Egypt, then he moved his family to Egypt to protect them from a famine…. and now generations have passed and God’s people have grown into a big nation and the Egyptians have enslaved them. God’s people called out to God, and God sent Moses to rescue His people and bring them out of slavery. After this brief introduction, skim through Exodus chapters 7-11 with the kids. (Have them open their Bibles and call out the things that that they see- maybe headings in their Bibles or words they don’t know). Work together to make a list of all of the plagues that God brought on the people of Egypt to show them that He is the awesome God who is God over all. Afterwards, fill in the gaps in the story by briefly talking through the plagues and how they showed the people of Egypt that God is God of all (He is sovereign) and that God is awesome. 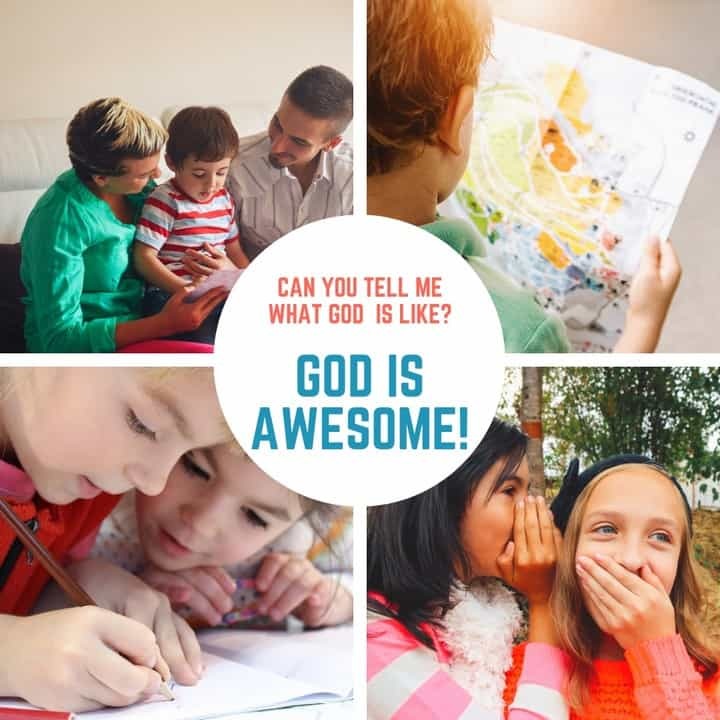 Tell the kids that this story helps us to see that God is awesome as we see God doing things that only He could do….things that amaze and astound us….things that cause us to be in awe of His power, His sovereign rule, He authority over all things. AWESOME = INSPIRING AWE OR AMAZEMENT. Ask kids in the group to read the other supporting verses to see times in the Bible where God is seen as being awesome ad have kids give examples of stories in the BIble that amaze them when they think about who God is or what He is like. Some of the verses to consider are: Exodus 15:11, Deuteronomy 4:34, Deuteronomy 7:21, Nehemiah 1:5. Since motions & actions help kids remember, choose an action for AWESOME. A good motion might be to open your mouth and eyes wide and put your hands on the side of your face like you’re saying WOW! Have the oldest boy in the group read this whole song (Exodus 15:1-18). After reading this song, have the other kids in the group point out the awe inspiring things that they heard in the Psalm. If time allows, you may want to give kids time to illustrate the memory verse Provide pages with the verse printed across the top and crayons or pencils. They could (1) draw a picture of the awesome things that God did to rescue His people from Egypt, (2) draw word pictures to help them remember this verse or (3) draw a picture of the awesome way that God rescued His people through Jesus. Read the memory verse (Exodus 15:11) a few times together and do the motion for awesome. Ask the kids why they think that God used these plagues to rescue His people from Egypt. Then, explain that these plagues were specifically chosen by God to show the people of Israel that He alone is God. Tell the kids that the Egyptians used to worship lots of different gods… a sun god, a water god, a god of the nile, a cow god and even a frog goddess; so, each of these plagues showed that He is the One true God and that he alone can rescue His people. Fast forward to today and people still try to be saved by worshipping false gods, and yet the Bible tells us in John 14:6 that Jesus is “the way, the truth and the life” and that “no one comes to the Father except through Him.” Just like these false gods couldn’t save the Egyptians, no other ways that people try today can save them; salvation is through faith in Jesus alone. Jesus‘ death in our place on the cross is one of the best examples of how awesome (or awe inspiring) God is. The thought of God Himself taking on flesh and dying the death that we deserve should lead us to see Him as the awesome God that He is. Give each child a blank piece of paper provide markers or colored pencils. Encourage them to write the words awesome somewhere on the paper and then write or draw something to help them remember this attribute of God. They could write the definition for awesome or the memory verse or they could illustrate any of the passages you read about God being the awesome. After a few minutes, bring the group back together and give kids time to share what they have drawn or written. Pray that the kids in the group would come to know God more and more each week through this study and that they would be reminded this week of God’s awesomeness as they think about the fact that Jesus died on the cross in their place. These lessons are such a blessing. They make the lessons so easy to teach. Thank you.